Rich in essential fatty acids and protein, adding almond milk to your homemade protein shake is a healthful way to boost calcium content and nutritional value. Made of ground almonds and water, almond milk contains no lactose, making it a popular vegetarian and vegan alternative to dairy milk. A great way to refuel post-workout, or as a healthy snack between meals, protein shakes made with almond milk can pack a powerful nutritional punch. Before you fill up your grocery cart with the ingredients in the recipes that follow, you'll need to make sure you've got a sturdy blender on hand. 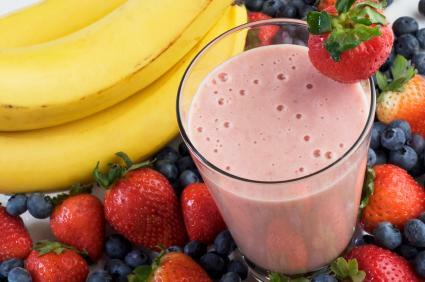 Additionally, the recipes call for whey protein powder, which is readily available at any health food store or grocer. Rich in vitamin A, mangoes are also a great source of vitamin C and iron. Use frozen or fresh mangoes for this recipe. If you're using fresh fruit, add one cup of ice cubes. Blend all of the ingredients for about two minutes, until you get a smooth consistency. Enjoy immediately. Chock-full of antioxidants, blueberries and almonds are a dynamic and delicious duo. Blend all of the ingredients for about two minutes, until consistency is smooth. Old-fashioned oatmeal provides a fiber-rich component to this protein shake. Add all ingredients to a food processor and blend until you get a thick, but foamy consistency (about two minutes). Serve immediately. These potassium-rich berries are also rich in protein. Blackberries contain two grams of protein per cup, while raspberries contain about 1.5 grams protein in a cup. Blend all of the ingredients until smooth and creamy. Bottoms up! Indulge in the classic pairing of chocolate and bananas. Blend all of the ingredients until you get a smooth and creamy consistency. Enjoy immediately. A glass of almond milk is loaded with as much calcium as one serving of vitamin D milk. In addition, almond milk boasts a high nutritional scorecard compared to its vitamin D counterpart, which contains four times as many calories and almost three times as much fat per serving. Enjoy almond milk in smoothies and protein shakes without the saturated fat or cholesterol of dairy. Low in carb and calorie content, almond milk is also safe for those who are lactose intolerant since it lacks casein. Whether your protein-shake regimen is meant for weight control, muscle gain, or both, incorporating almond milk can be a healthful and delicious way to mix it up.